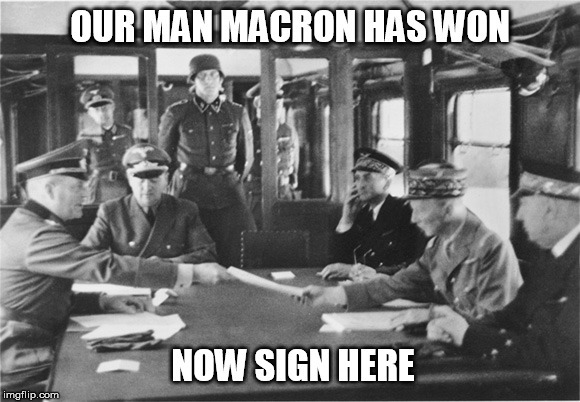 I am really hoping for Marine Le Pen, we will see how this comes out. Hopefully Russia can help give Marine Le Pen a helping hand . I think of course they will not do anything. PARIS, March 6. /TASS/. Bordeaux’s Mayor Alain Juppe has refused to take part in the presidential race as a candidate from the Republican Party. Speaking at an urgent news conference in Bordeaux that he had convened, the politician said that he "will not be able to ensure the party’s unity." "Ensuring the party’s unity today is a far more difficult task than a few months ago. Now, it is too late to put forward my candidacy," the mayor said. "I confirm once and for all that I will not be a candidate in this election". Juppe voiced regret over the current crisis in the Republican Party and the lack of the traditional unanimity with the centrists. "Never before have the elections in France been in such a muddled situation," the politician admitted, adding that other candidates will either not make it to the second round of the election or "are steering the country toward catastrophe." "The victory of Emmanuel Macron [leader of the En Marche, or On the Move, movement] would mean the continuation of the destructive policy pursued by [French President Francois] Hollande, while the National Front will steer the country toward catastrophe," the Mayor of Bordeaux asserted. Mayor Juppe’s speech took center stage. He admitted that he had received many appeals from his fellow party members asking him to run for president against the backdrop of the scandal plaguing Francois Fillon. "I do not want to take part in this bargaining," Juppe emphasized. of professional Soros ,EU elites and US congress financed protesters that will take advantage of the EU open borders policy for EU citizens, to destabilize France and sink France into a civil war. It is quite scary , how vulnerable members of the EU will be for having open borders policy. If Lepen Wins ,she will need a lot of help from Russia to return security to their country and to hold power .Because the Globalist open Borders elite in EU is also powerful and can bring any country in Europe to its knees ,using the retarded open borders policy ,that one of its goals is to make it easier to transfer protesters from one country to another to keep any European nation in Check and very loyal to the EU and NATO. Im skeptic that UK will be able to leave ever the EU also , Trump revolution have been neutralized and he is officially a puppet now of the Globalist elite. if Le Pen wins , expect the most violent protest ever in history of France. seems more like wishful thinking. Liberal gay loving lefties who think PC and act like nazis have had their chance... the moral majority in the west seems to have had enough... they want better security, they want their health care and other social benefits respected... not abused. I really hope Le Penn wins. French politics seems to require the same shake up the US system needed and almost got. Saw a post in another forum that detailed extensive rigging in the French election. A LOT of discarded ballots reportedly. 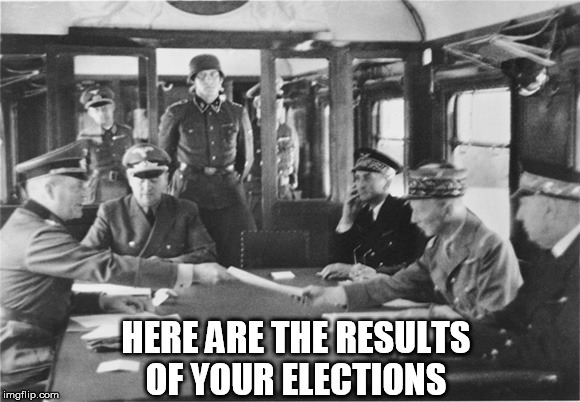 Damn, i failed, it was suppose to mean France's surrender, not vote rigging, here's another. Hahahaha... ah well... congratulations France... you voted for more of the same... enjoy.